Our wall storage cubby is handcrafted from solid hardwood; no laminates here. Our wall cubby comes with three storage compartments and an integrated Shaker peg rack with 6 pegs. And the top is also made to be used as a shelf. It will go a long way towards helping you organize your entry way, mud room, garage, or children's room. 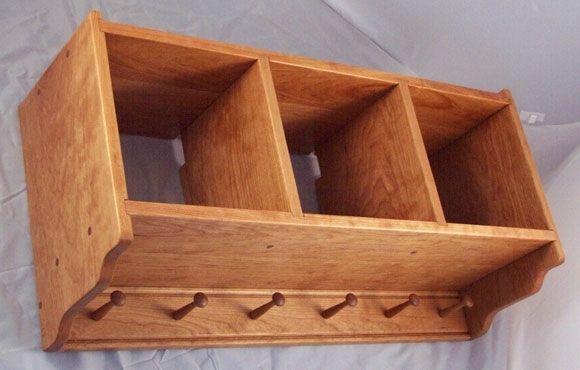 Our wall cubbies come in either an unfinished poplar or finished hardwood and you may also a Colonial End (shown in photo) or a Shaker End, for a more contemporary look.